1. A secret joint conspiracy or plotting to do something; usually, wrong or illegal: "He was involved in the connivance of his brother's shoplifting with the understanding that he would share the things that were stolen." 2. Tacit encouragement (expressed without being said directly) or an agreement to doing some kind of wrongdoing; unspoken encouragement of or consent (without participation) to wrongdoing by someone else. 3. Pretended ignorance or a secret encouragement of wrongdoing. 1. To cooperate secretly in an illegal or wrongful action; to collude; to conspire: The dealers connived with customs officials to bring narcotics across the border from Mexico. 2. To avoid noticing something wrong; to give aid to wrongdoing by not telling about it or by secretly helping it take place: The new mayor of the town was absolutely straightforward and honest and didn’t connive at all like his predecessor with illegal activities. 3. To feign ignorance of or fail to take measures against a wrong; therefore, implying tacit encouragement or consent: A prison guard connived in aiding a prisoner's escape and he was later suspended from his position. 4. To avoid noticing something that one is expected to oppose or to condemn; to give aid to wrongdoing by not acting or speaking out about an illegal act: Although Jack had seen that his friend had hit another student, he connived by not telling the teacher what had happened. 5. To indulge to do something others oppose or criticize: June said her fellow workers connived to defeat the proposal that their company should increase the prices of their products. 6. To pretend ignorance of or failing to take action against something someone ought to have opposed: Cathy connived to stop the appointment of the new supervisor although all of her colleagues were giving their support to have him. 7. To indulge in or be involved in secret sympathy, to wink at, to cooperate with secretly, or to have a secret understanding: The two sisters connived to watch a TV program late at night after their parents had gone to bed! 8. Etymology: from Latin conivere, "to wink"; from com-, "together" + basic element nictare, "to wink". Hence, "to wink at (a crime), to be secretly knowledgeable". © ALL rights are reserved. 1. A reference to being brought close together; arched inward so that the points meet; converging; in close contact but not fused; as, the connivent petals of a flower, wings of an insect, or folds of membrane in the human system, etc. 2. Descriptive of being willfully blind or tolerant of something that should not be. 3. In anatomy, the connivent valves are those wrinkles, cellules and vacuoles, which are found on the inside of the two intestines, ilium and jejunum. Vacuoles are the spaces or cavities within a cell that function in digestion, storage, secretion, or excretion. 4. Referring to shutting the eyes and trying not to see something that a person doesn't really want to see. Someone who plots to secretly cooperate with another person, or others, in order to commit a crime: "The woman was identified as a conniver who colluded with others to rob the bank." 1. The practice of planning secretly to do something, usually something wrong or illegal. 2. 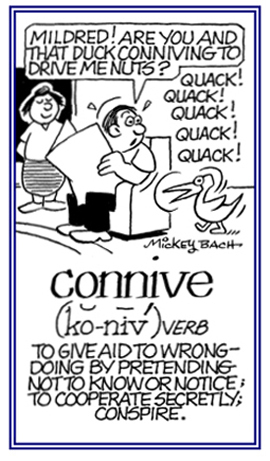 The pretense of not knowing about or doing nothing to stop a wrongful or illegal act; thus, showing encouragement of or consent to the act: "Connivery is usually a procedure done by con men, shady business moguls, and by manipulative social climbers." 1. Not pretending ignorance of or having failed to take action against something someone ought to have opposed. 2. Not having indulged in nor been involved in a secret sympathy, not winked at, not cooperated with secretly, and not having had a secret understanding about something.